Miami, FL – Wynwood Brewing Company has just won top honors in the Robust Porter category for its Pop’s Porter beer at the Great American Beer Festival in Denver, Colorado. The WBCo., which just celebrated one year since starting production, is the first production craft brewery in the City of Miami. The Great American Beer Festival is the most prestigious competition and largest festival for American produced beers in the United States. The award ceremony was held this afternoon, October 4th in Denver, CO. The WBCo’s Pop’s Porter recognition is the only Gold Medal given to a beer in the state of Florida. The other winners for the state were Tampa Bay Brewing Co. with a Bronze Medal for its Reef Donkey APA – an American-Style Pale Ale; and a Bronze Medal for Motorworks Brewing for its Vienna-Style Lager. Named after Luis “Pops” Brignoni – co-owner with his son Luis Brignoni of WBCo, Pop’s Porter is made with “a blend of roasted malts that gives the beer a nice, roasty aroma with hints of chocolate and coffee. The malts contribute to the deep dark color of the beer.” The beer has an ABV of 6.2%, a Hoppiness of 41.0, and Color (SRM) of 36.9. 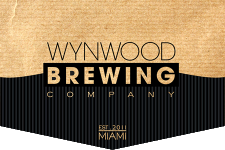 Wynwood Brewing Company, which opened in August 2013, is the City of Miami’s first production micro brewery. It is located in the heart of the Wynwood Art District, featuring the brewery and an art-filled Tap Room. The craft brewery is family owned by the Brignoni family and operates with the simple objective of “bringing fresh, delicious and creative beers to South Florida’s beer lovers.” The brewery had an expansion in April 2014 which enabled them to triple its production. The WBCo beers are distributed throughout Florida by Brown Distributing.